This Colour that Disturbs Me | Cette couleur qui me dérange : Khady Pouye sounds the alarm on the practice of xessal (skin bleaching) by Mame Woury Thioubou. SOURCE : LE QUOTIDIEN. IMAGE : Khady Pouye, laureate of the UEMOA (The West African Economic and Monetary Union) award for best documentary, Fespaco 2013. Translation from French by Beti Ellerson. The practice of depigmentation has reached unprecedented levels in Senegal. Numerous women opinion leaders have even become promoters of this trend. This situation motivated filmmaker Khardiata Pouye to make the film entitled: Cette couleur qui me dérange (This Colour that Disturbs Me). 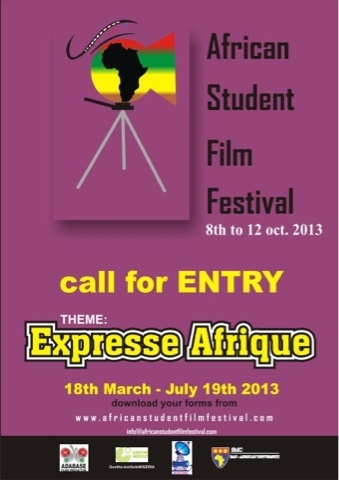 This socially committed, evocatively-titled film, was recently screened at the Institut français de Dakar. Ministers, company directors, stars, artists, or even intellectuals of renown...numerous are these Senegalese women opinion leaders who incidentally participate in the promotion of these skin bleaching products called "xessal". In light of such observation Khardiata Pouye Sall took up her camera to denounce this phenomenon. In this rather evocatively-titled 26-minute film, the filmmaker breaks the silence of authority around this devastating practice. According to her, "xessal" causes tremendous suffering for the women who practice it. She thinks that this type of alert regarding the practice is not sufficiently given, beyond the few activities lead by medical associations, with little impact. Therefore, the documentary, Cette couleur qui me dérange has as objective to sound the alarm. Especially given the inaction of public authorities. "If the authorities, prohibit the entry of these products into the country, these women would no longer be able to use them," Ms. Sall states with outrage. In order to put the finger on the culprit, she gives voice to several key resource persons, such as a customs officer who clarifies, "the law only requires that the custom duties for these products be paid." So when will there be consciousness raised about it and the political will of the powers that be to stop it? Furthermore, the documentary reveals tips from the women who practice "xeesal". Assisted by men attracted by easy gain, these women divert a number of natural products from their intended purpose as a means to lighten their skin. "To be lighter at any cost." This appears to be the motto of these women who never seem to run out of ways or the imagination to concoct dangerous recipes in order to attain this perceived beautiful skin. But what motivates them to participate in this self-destructive practice? "Women are often influenced by their entourage. They have a sister who does it. They attended a ceremony where they did not obtain the desired effect because of their black skin; or even still, their is a man out there who says that he prefers a woman with light skin. There are many reasons that these women practice "xeesal" without realising what they are losing" says Khady Pouye, who is also director at the Radio­diffusion télévision du Sénégal. Cette couleur qui me dérange clearly shows that initially "xessal" provides these ladies a sense of pride. But it also reveals that over time its irreparable damage leads them to the dermatologist. To prove the point, the filmmaker takes her camera to the dermatology department of Aristide Le Dantec Hospital where visits directly resulting from "xeesal" constitute 30% of the consultations. Showing the terrible images of the physical wounds that are the result of this practice is also serves as a warning to the users. These wounds may cause skin cancer as well as Erysipelas, a skin infection which could be deadly. An added dimension to dissuade its usage, doctors emphasise its immeasurable psychological damage. Ms. Gnagna Sidibé, the director of the national television, came in person to the recent screening of Cette couleur qui me dérange in order to encourage a wide dissemination and outreach throughout Senegal. Cette couleur qui me dérange : Khady Pouye sonne l’alerte sur le xessal par Mame Woury Thioubou. SOURCE : LE QUOTIDIEN. IMAGE : Khady Pouye, lauréate du prix pour le meilleur documentaire de l’Uemoa (Union économique et monétaire ouest-africaine), Fespaco 2013. La dépigmentation a pris des proportions inégalées au Sénégal. De nombreuses femmes leaders d’opinion en sont même devenues les promotrices. Une situation qui a poussé la réalisatrice Khardiata Pouye à produire un film intitulé : Cette couleur qui me dérange. Ce documentaire engagé et au titre évocateur a été recemment projeté à l’Institut français de Dakar. 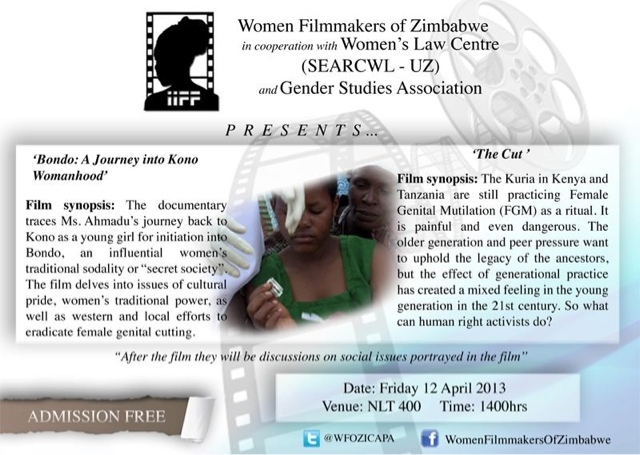 Women Filmmakers of Zimbabwe in cooperation with Women's Law Centre and Gender Studies Association present : Bondo: a Journey into Kono Womanhood by Sunju Kumba Ahmadu and The Cut by Beryl Magoko with an after-screening discussion of social issues portrayed in the film. Who said that working moms could not have a successful profession and a happy family, I believe we working moms can have it all. Juggling a career and a family is no easy feat, in fact it is pretty hard when your kids are still young like mine, eldest daughter is now eight years and my second born is one year four months. As it is very difficult to build a testimony you face a lot of temptations but if you put all your faith in God and continue being prayerful you will definitely win. The same applies to careers and families you sometimes reach a stage where you feel the need to step back and concentrate on your family. This may result in your career heading for the rocks but if you believe that you can have it all, you will yield good fruits of your perseverance that is a happy family and a career.